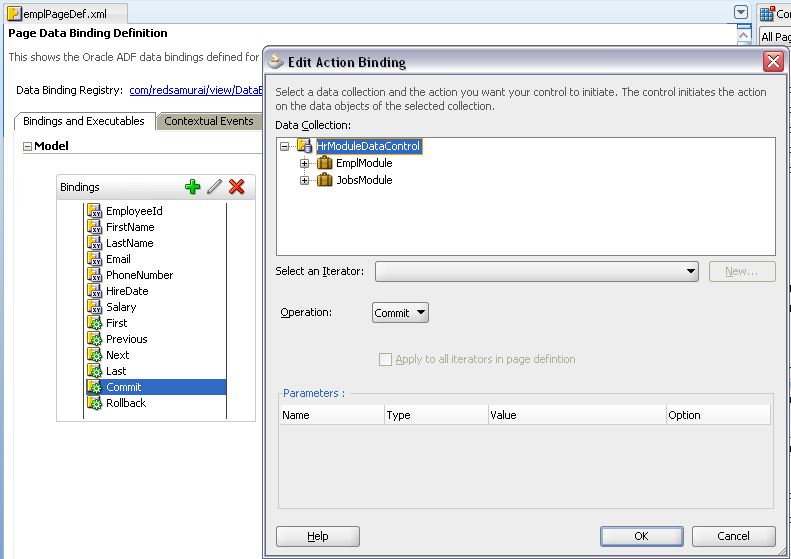 As you know, ADF 11g allows to secure read, update, and delete operations on EO level. 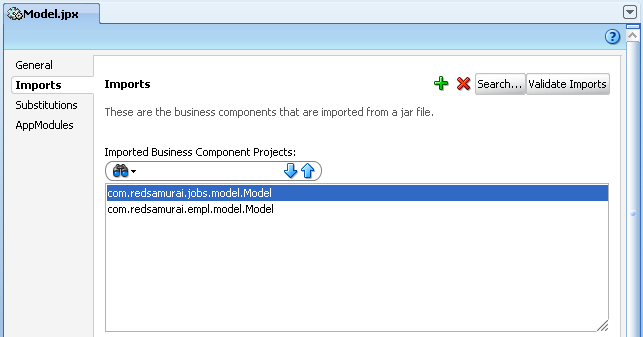 However there is no default support for insert operation. 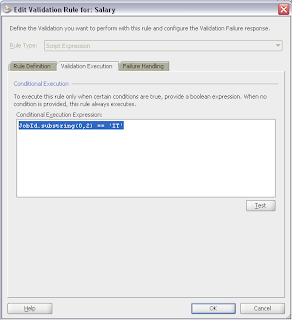 Typically, developers will go and set Expression Language statements directly on Web page to enable/disable one or another attribute. While this works, it is not good in terms of maintenance. 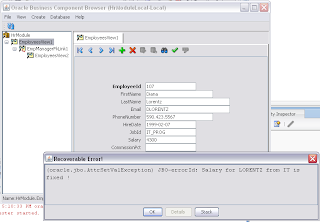 Today I will describe another approach, where I will override isAttributeUpdateable() method on EO to evaluate security rule on insert. 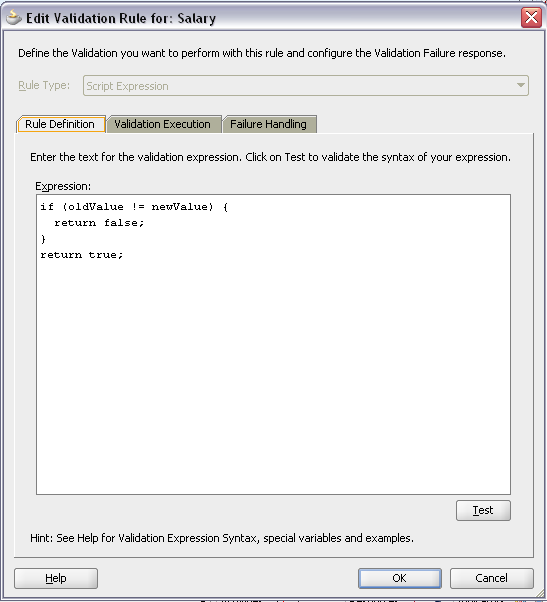 I believe, this approach works better comparing to Expression Language on front end, because it allows to secure Model directly. This is especially good, when you are using same EO's in different forms - no need to implement same security rule again. Oracle Fusion application typically includes multiple regions and integrates smaller applications into dashboard for better user experience. 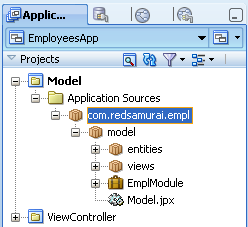 Users like this approach, however we should check what are implications for technical side. Today I'm describing different approaches for ADF Regions integration and use of Nested Application Modules. 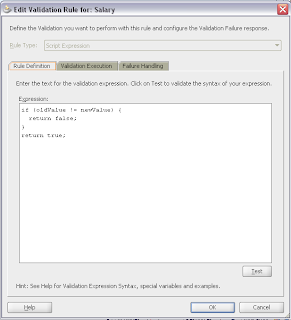 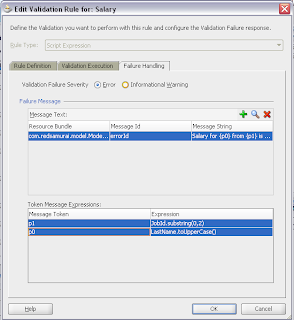 Download sample application - ADFIntegrationNested.zip. 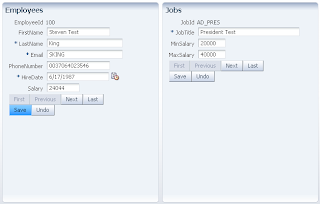 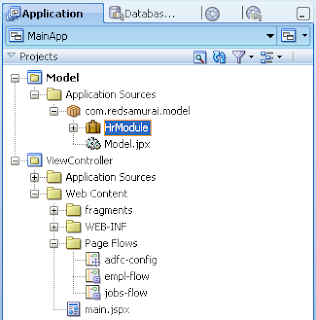 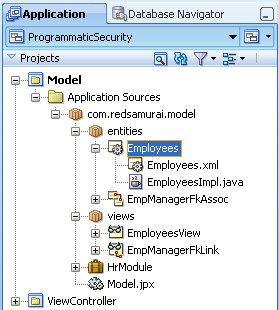 This sample contains multiple Oracle JDeveloper 11g PS2 applications to demonstrate integration functionality together with nested application modules usage. 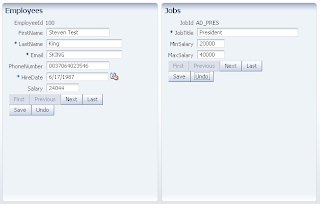 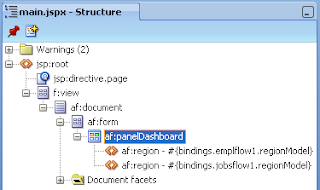 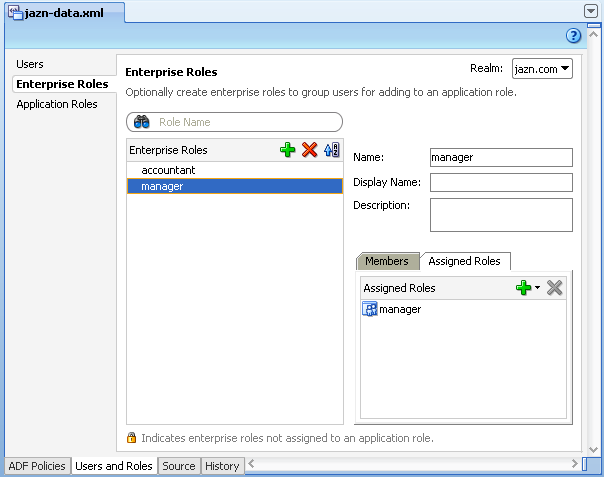 There are two applications two integrate ADF BC Model and use Business Services inside ADF Regions. Why two applications? 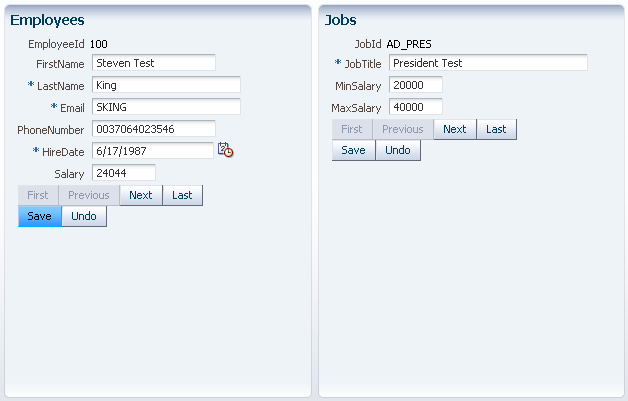 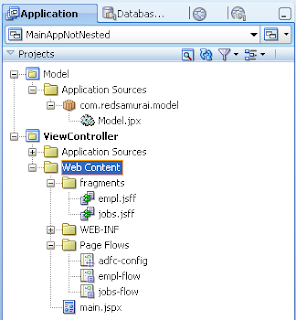 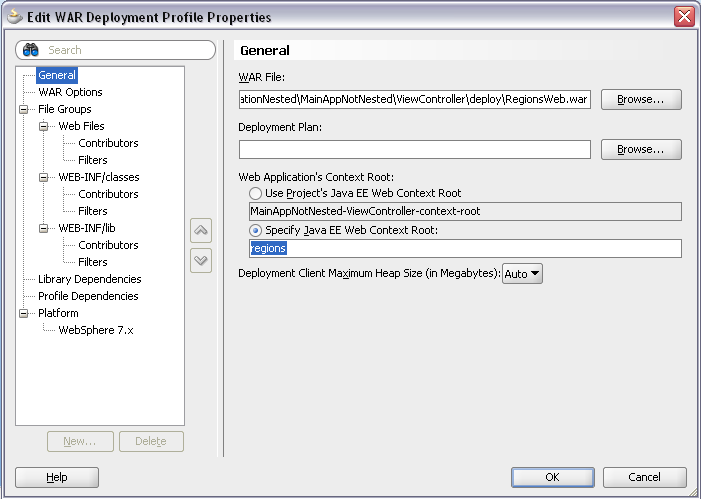 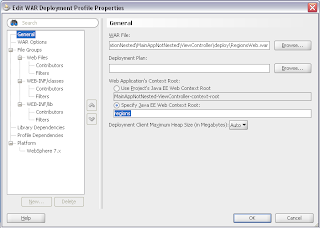 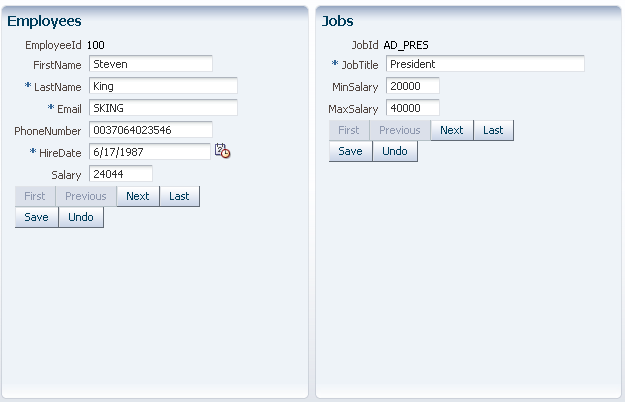 First integrates ADF JAR's directly into ViewController - means using Application Modules directly from ADF JAR's. 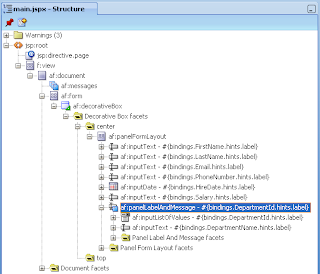 Second integrates ADF JAR's into local Model project, Business Services from imported libraries are exposed through local proxy Application Module - this Application Module contains Nested Application Modules from imported libraries. 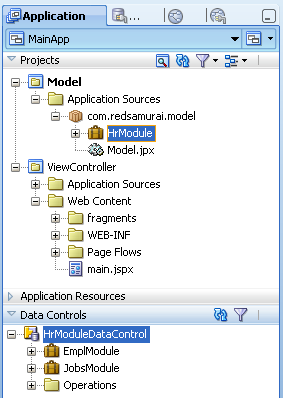 Thats quite logical - we are using two Application Modules, both are present on current page inside of two regions. 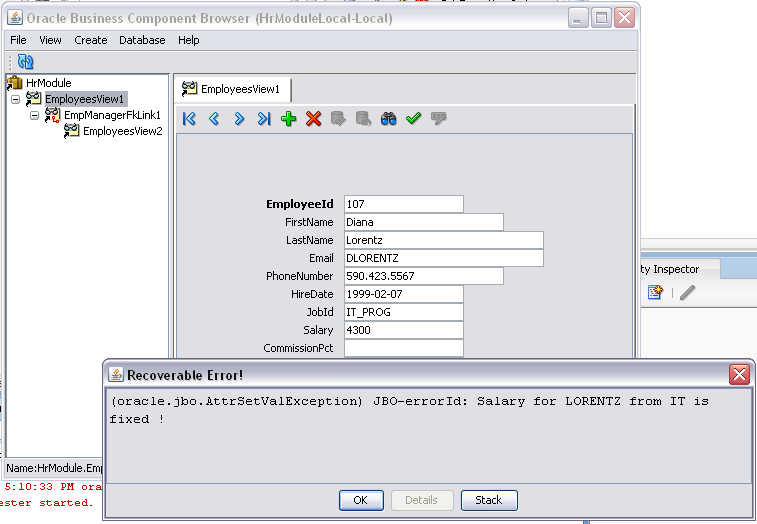 However, from performance view its not ideal - each user will use two database connections in this case. 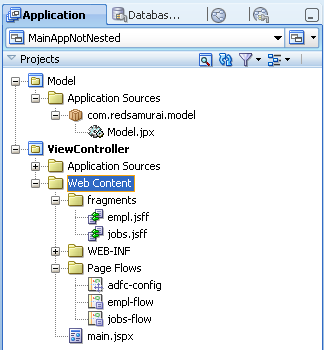 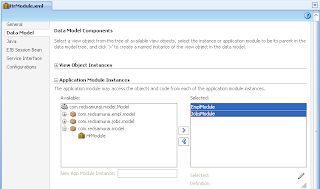 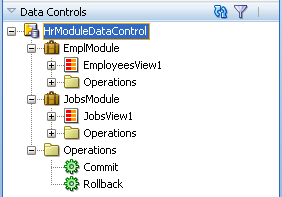 I'm using those View Objects from Nested Application Modules inside ADF Regions. 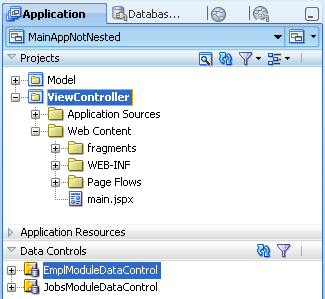 Here is one very critical difference between ADF Region and ADF Page - even we are using Nested Application Modules and Commit operation from master Application Module - it still commits only transaction for current region (specific imported Application Module), which is great. 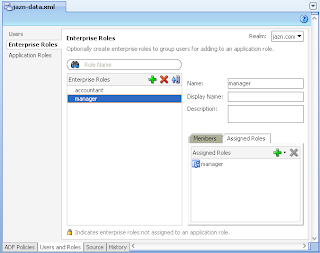 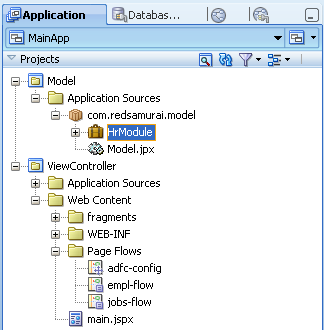 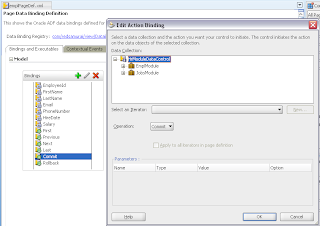 With ADF Page it would commit changes from all Nested Application Modules at once. 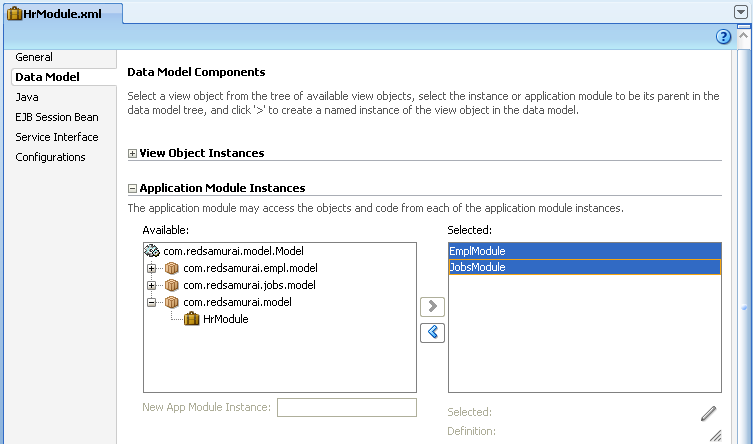 As you can see, Nested Application Modules in combination with ADF Regions can be great performance improvement in Oracle Fusion applications. 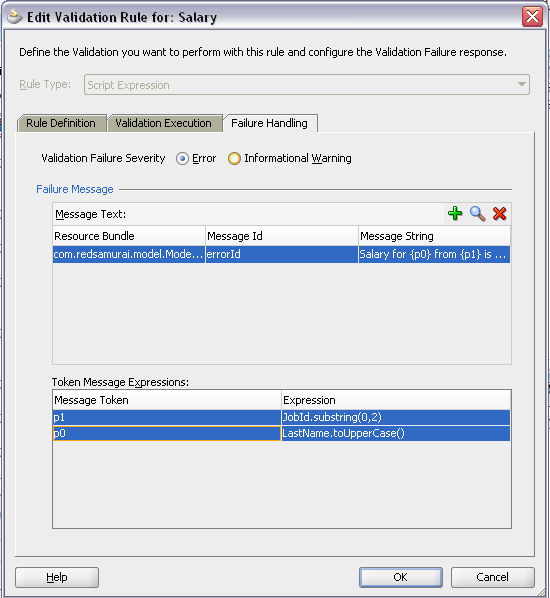 Quick note about ADF Secure application deployment. 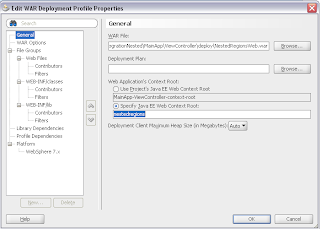 Juan Ruiz from Oracle explains how to deploy ADF Secure application on standalone WLS, using WLS console. 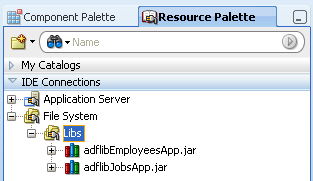 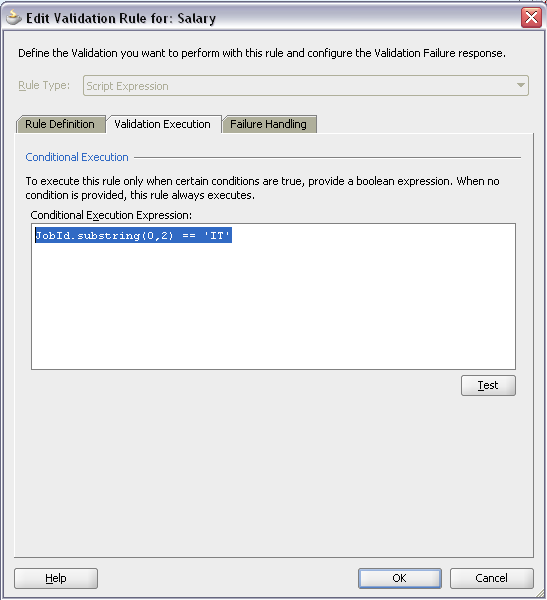 Check his blog post - Deploying an ADF Secure Application using WLS Console. 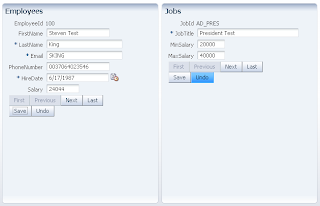 Groovy Script support by Oracle ADF 11g gives us good flexibility to operate attribute values and implement business logic. 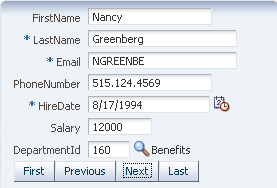 Often you need to parse String type attribute values - it can be easily done using Groovy script directly in ADF BC. 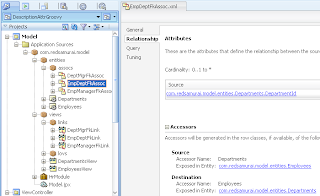 There was a question on ADF EMG group, about LOV description texts. 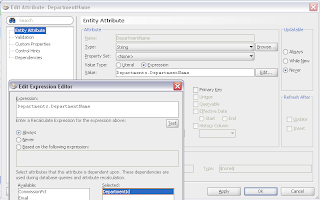 While it is usually recommended to create Association and join description text attribute into VO, sometimes people are looking for different approaches (for one or another reason). 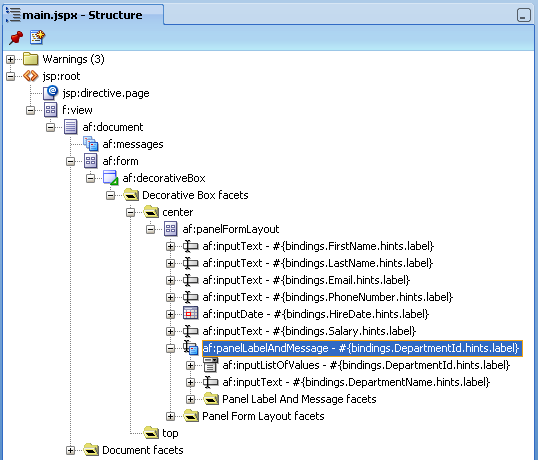 Today I will tell you about approach, I recently discovered - to get LOV description text through Groovy script, without joining attribute into VO. 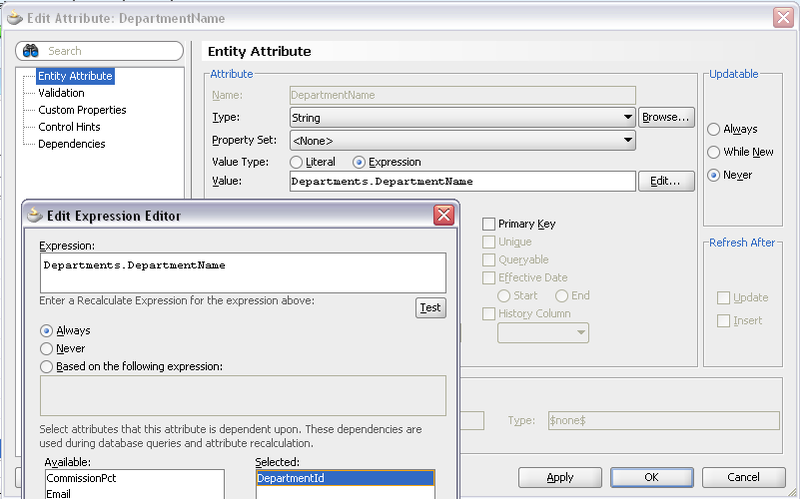 With this approach, framework executes fault-in query for description text, directly from EO. 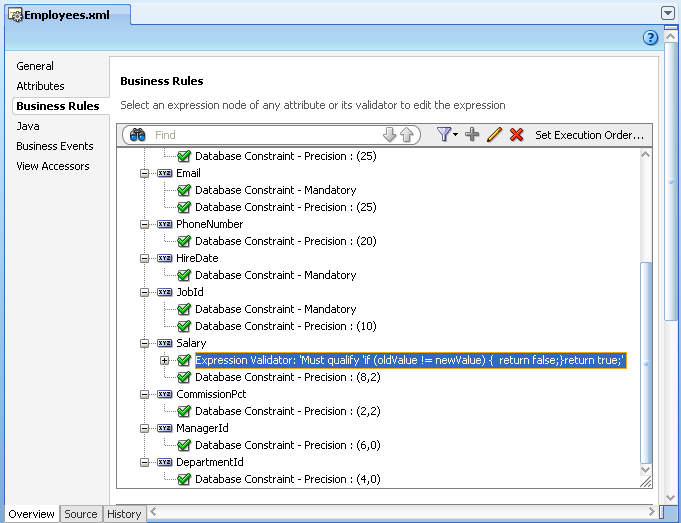 This means, instead of one join SQL statement, there will be executed smaller SQL selects for each LOV description, plus main VO. 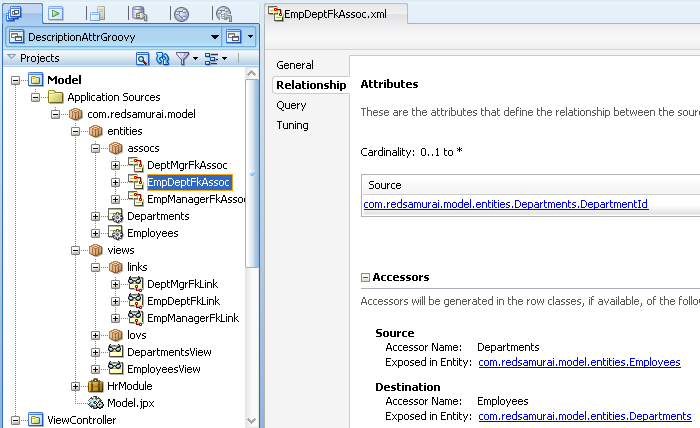 To read more about fault-in queries executed from EO, check Steve Muench blog - Difference Between View Object Select and Entity doSelect() Method. 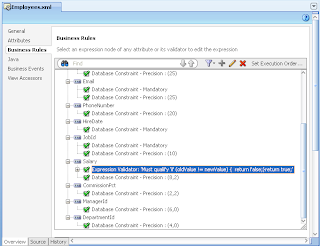 Let me repeat myself - its not really recommended approach, I personally prefer to join description attribute into VO, because it allows to run single joined query. 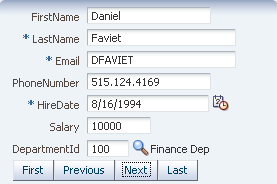 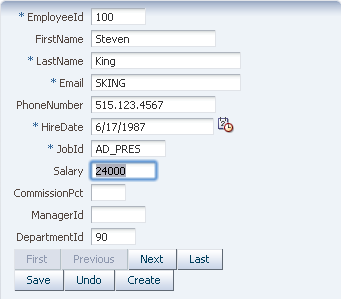 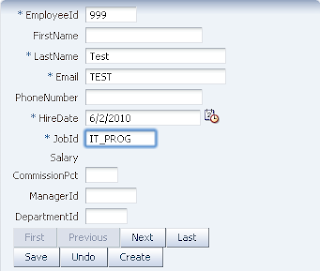 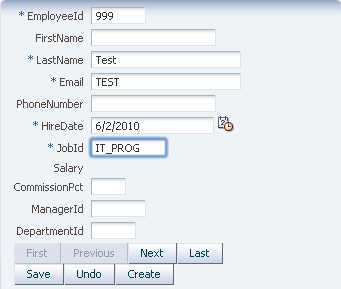 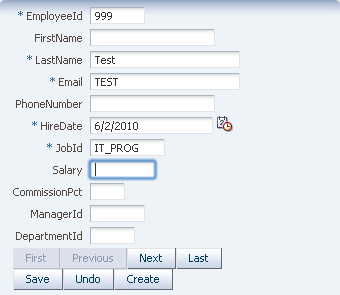 This will allow to refresh DepartmentName with correct value, when DepartmentId will be changed. 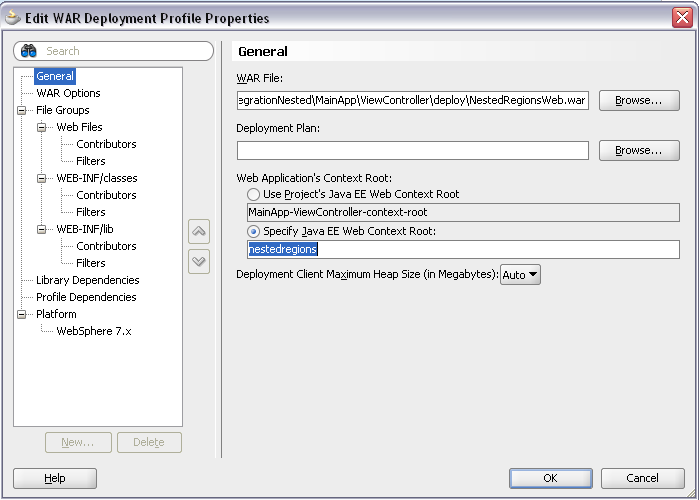 No Java, No Magic - all works in declarative way.